Denying the allegations of suspended Aam Aadmi Party (AAP) MLA Kapil Mishra to have been manhandled and pushed by the party leaders inside the Delhi Assembly on 31 may, the Arvind Kejriwal-led party said the former's conduct was visible to everyone and he wasn't beaten up by anybody. "I think Kapil Mishra's conduct is visible to everybody from the last two-three weeks. He is just trying to find out ways to implicate party leaders, MLAs and the ministers. He was taken out by the marshals. 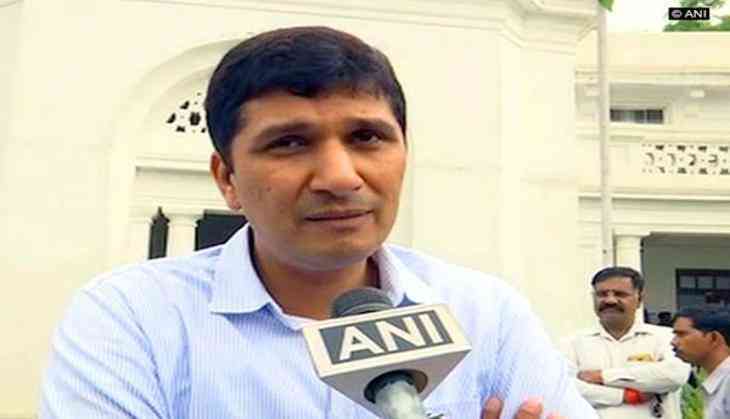 I witnessed everything and I don't think he was beaten up by anybody not even by the marshals," AAP leader Saurabh Bhardwaj told ANI. He further said that Mishra could have attacked Delhi Chief Minister Arvind Kejriwal or Deputy Chief Minister Manish Sisodia. "He came with a strategy which was aligned to the Bharatiya Janata Party (BJP) MLAs. BJP MLAs Vijendra Gupta and Sirsa were trying to raise the issue of medicines in Delhi government hospitals. Though the speaker did not allow them and when Manish Sisodia was trying to answer queries over the medicine issue, Kapil Mishra came up with the hoarding in his hand and the Speaker warned him to stay at his place. He still jumped towards the ministers probably with a thought of creating violence," Bhardwaj added. He said that the Speaker called for the marshals and till the time they could reach, a few MLAs did stop him from reaching to the ministers. The Delhi Assembly witnessed dramatic moments earlier in the day when Mishra was marshalled out following a scuffle with party MLAs. Mishra, once a close confidante of Kejriwal had levelled corruption charges against him and other AAP leaders, which created ripples in the city politics and dented the image of the party. Mishra had alleged that Health Minister Satyendra Jain gave Rs. two crore "illegal cash" to Kejriwal at the latter's official residence and helped "fix" land deals worth Rs 50 crore for Kejriwal's relatives. In his latest allegation, Mishra had said the city's health department was witnessing a scam in purchase of medicines by the AAP government. Mishra alleged irregularities in purchase of medicines and in payment to suppliers. The AAP has denied the charges levelled by Mishra and has put him under suspension.